Paul Vaucher, was born in 1887, the son of Edouard Vaucher, dean of the Faculté protestante de Théologie de Paris, and was educated at the Sorbonne and at the École libre des Sciences politiques. He was licencié de philosophie in 1906 and agrégé d’histoire et géographie in 1912. Among his teachers were Émile Bourgeois, the noted historian of French diplomacy and institutions, who became his thesis supervisor, and Élie Halévy, the eminent specialist on British history, who became his life-long counselor and friend. Vaucher’s first important article was published in 1913. Entitled “Une Convention Franco-Anglaise pour régler le commerce et la navigation dans les Indes Occidentales, 1737-1740,” the article bore the hallmarks of his later work: an abiding interest in the interplay of domestic politics and international diplomacy; meticulous attention to the documentary evidence; a remarkable sense of detachment, or as Richard Lodge put it, “for a Frenchman he is conspicuously undogmatic;” and, lastly, a continuing concern with the nuances of les études anglaises. This interest was encouraged by his teacher Élie Halévy, who, on his annual trips to London, introduced the young scholar to many leading lights of the british intelligentsia. 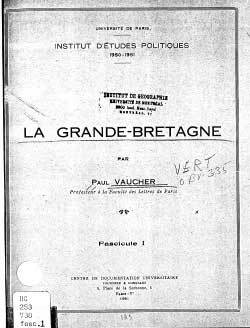 During the war of 1914-18 Vaucher taught history and geography at a number of lycées. After the war, he was invited to lecture on modern European history in Sweden at the University of Lund. From there, he journeyed to London, where he pursued his study of Anglo-French diplomacy and politics. In 1922, with the backing of Halévy, he was appointed to the recently founded chair of French history and institutions at the University of London; and he taught in London for the next twenty years. In 1924, he published a two-volume thesis on the era of Walpole and Fleury which was well received. In the US, W. T. Morgan spoke of the volumes as a “notable contribution.., scholarly without being pedantic, critical without being dull.” And in England that curmudgeon among critics, Richard Lodge, grudgingly admitted that not only had Vaucher “made admirable use of his materials” but that “his insights into English domestic parties and politics is unusually accurate.” Vaucher also carried les Études anglaises to the École des Sciences politiques in Paris, where like his mentor Ha1évy he offered special courses on England and the Empire. In 1945 he was called to the chair of eighteenth-century history at the Sorbonne, from which he retired 11 years later in 1956. The Centre de documentation Universitaire published many of his course notes. The ones from 1954 on were republished in 1954 with editing by Goglin. He died in October, 1966. A good resume of his life can be found in J. Rule (1967), Paul Vaucher: historian French Historical Studies, Vol. 5, No. 1. (Spring, 1967), pp. 98-105. Vaucher, P. (1924). La crise du ministère Walpole en 1733-1734. Paris, Plon-Nourrit et cie.
Vaucher, P. (1924). Robert Walpole et la politique de Fleury (1731-1742). Paris, Plon-Nourrit. Vaucher, P. (1926). Le monde Anglo-Saxon au XIXe siècle. Volume XII dans la série Histoire du monde. E. Cavaignac. Paris, De Boccard. v. 12, t. 1: 243. Vaucher, P. (1934). Post-war France. London, T. Butterworth ltd.
Vaucher, P. and P. H. Siriex (1936). L'opinion britannique, la Société des Nations et la guerre italo-éthiopienne. Paris, Centre d'Etudes de Politique Etrangère. Section d'information. 2. Vaucher, P. (1938). Social experiments in France. 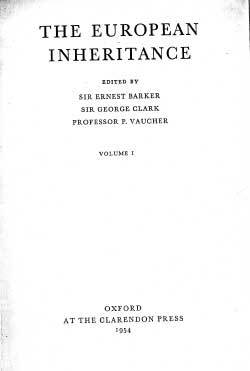 Barker, Sir Ernest, Clark, Sir George and Prof. Paul Vaucher. (1954). The European inheritance. 3 volume objective history commissioned by the Ministers of Education of Allied governments, Clarendon Press, Oxford. Halévy, E. and P. Vaucher (1947). The Age of Peel and Cobden. A history of the English people, 1841-1852 ... Translated from the French by E. I. Watkin. [Edited and completed by Paul Vaucher.]. London, Ernest Benn. Vaucher, P. (1965). Recueil des instructions données aux ambassadeurs et ministres de France depuis les Traités de Westphalie jusqu'à la Révolution française. Paris, Commission des archives, diplomatiques, Editions du Centre national de la recherche scientifique. Vaucher, P. and Université de Paris. Institut d'études politiques. (1946). L'Empire britannique contemporain. Paris, Centre de documentation universitaire. Vaucher, P. (1948). La France de Henri IV et Louis XIII. Paris, [Centre de documentation universitaire]. Vaucher, P. (1949). Le despotisme éclairé (1740-1789). Paris, Centre de documentation universitaire. Vaucher, P. (1951). La Grande-Bretagne. Paris,, Centre de documentation universitaire. Vaucher, P. (1952). Le Commonwealth. Paris,, Centre de documentation universitaire. Vaucher, P. and J. L. Goglin (1978). 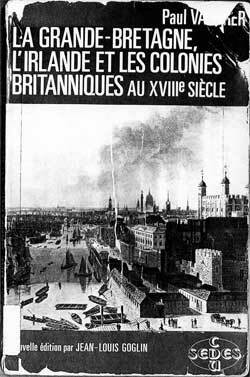 La Grande-Bretagne, l'Irlande et les colonies britanniques au XVIIIe siècle. Updated re-issue, Paris, Société d'édition d'enseignement supérieur. Vaucher, P. (1954). L'évolution sociale et religieuse de l'Angleterre au XIXe siècle. Paris, Centre de Documentation Universitaire.